A painting by street artist Banksy as seen a side street of the Bataclan concert hall commemorates the 90 people killed in Paris on Nov. 13, 2015. The director of the Bataclan said the painting of a mourning young girl was stolen using an electric saw and crow bar on Jan. 26, 2018. A French judicial official says police are investigating the theft of an artwork by the British artist Banksy that was painted as a tribute to the victims of the 2015 terror attacks at the Bataclan music hall in Paris. 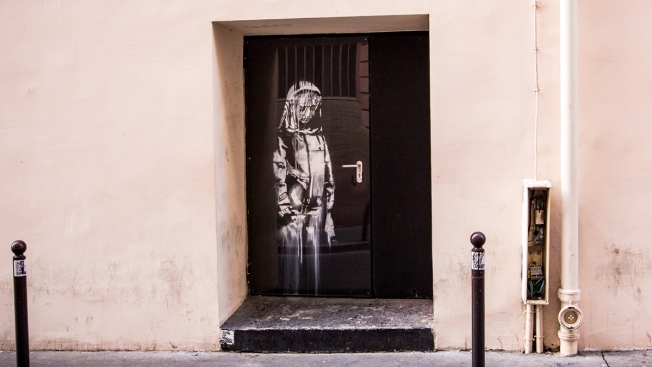 The artwork, a black image appearing to depict a person mourning, had been made on an emergency door at the Bataclan. It was stolen last week. The judicial official was not authorized to be publicly named because the investigation is ongoing. "Banksy's work, a symbol of remembrance and belonging to all: locals, Parisians, citizens of the world, has been taken from us," Bataclan officials said on Twitter. Ninety people were killed on Nov. 13, 2015, at the Bataclan when Islamic extremists invaded the music hall, one of several targets that night in which 130 people died. 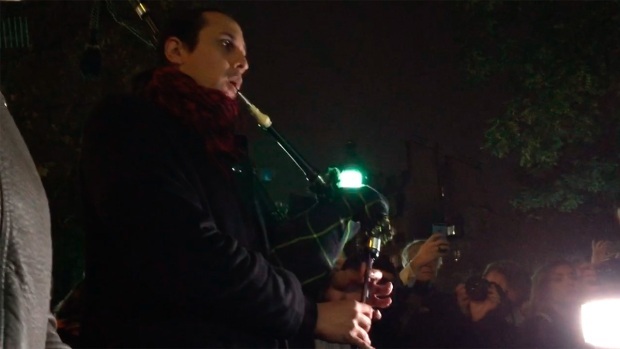 Louis Victor, a 26-year-old Frenchman visiting from his home in Essonne, south of Paris, played "Amazing Grace" on bagpipes Saturday at the police cordon near the Bataclan concert hall. A memorial has sprung up outside the venue. At least 127 people died Friday night in shootings at Paris cafes, suicide bombings near France's national stadium and a hostage-taking slaughter inside the concert hall.